As a handmade business owner, you’ve probably heard the term ‘strategy’ around a lot. You know that strategy is a plan, but what exactly is strategy when we are talking about the content you post on social media? Strategy is simply having intention and purpose behind everything that you do. Intention behind every Instagram and Facebook post. A purpose for social media. Having intention and purpose behind what you’re creating means that your posts and content really aligns with your brand ‘why’ and your goals. It means that there’s a reason you’re creating all this awesome content, and it’s not just for the sake of it, or because you’ve been told you should. It means that your content is being used to build your brand’s know, like and trust factor; that it’s adding value. It also shows your dream customers that you understand them, that you’re thinking about them. That you care about them. And that you want to help them. So how do you make sure that there is a strategy behind your social media? Well first you need to know your purpose. What is they ‘Why’ of your business and what are your goals? 2)	What do you do? 3)	Who do you do it for? 4)	What do those people want and need? 5)	How do they change or transform as a result? 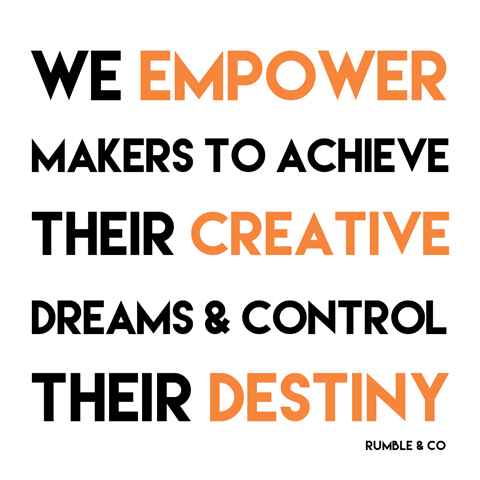 Because we learn best from examples, here is an example of our own business – Rumble & Co.
1)	We are Jo and Meredith. 3)	We do it for ambitious makers with handmade businesses that sell online. 4)	The makers want to know what is the good from the bad information out there on doing business online with someone who understands handmade business and will take the time to understand their individual business so they can apply the good information to their business in an empowered, efficient and effective way to achieve their goals. 5)	So they can be financially independent, achieve their creative dreams and control their destiny by living life on their terms. As Meredith would say – BAM. Now, how does knowing your ‘why’ help you with your content strategy? Well once you know it, you use it practically to filter your content before every social media or blog post. We’ll go into that in a minute. So now you know your ‘why’ what comes next are your business goals. What are you aiming for? Where do you want to be in 12 months? What does that look like, specifically? Aside from breaking that 1k down into how many sales that is at the optimum selling price for her products (calculated from costs of goods, costs of listing, overheads and labour plus a margin to allow for wholesale) and on the average number of items per sale she is achieving, we need to break that goal down into how she is going to get customers chomping at the bit. This includes working out a social media strategy. To really simplify it – we need to increase her know, like and trust factor. This is not unique to this maker. While the acceleration at which this happens, and the specific steps she takes will be specific, the goal is universal. For example, she may reach out more frequently to influencers, to increase her ‘know factor’ or brand recognition, than a maker who has a goal to work only 20 hours a week. Just a quick note here: your social media goals should measure outcomes and not activities. For instance, you don’t want your goals to be to post 3 times a day to Instagram. What good does that do you? You want to post engaging behind-the-scenes content on Instagram to increase the ‘know factor’, or awareness of your brand. Once you know your goals, you can combine this with your ‘why’ to filter your posts to ensure they are going to have intention and purpose. 1)	Will this (insert your ‘why’)? 2)	How will it? What value will your audience get from this post – specifically? For example, will it educate, inform or entertain them? What is the intention? 3)	How does that align with our social media goals? What goal is this post contributing to? What is the purpose? 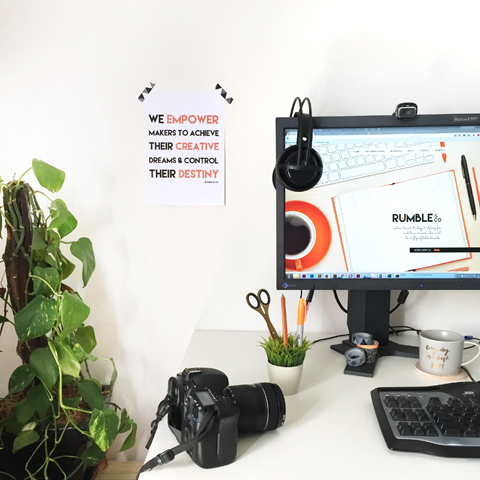 At Rumble, we have our ‘why’ printed next to our desks and before we hit post or send EACH time, we go through our checklist. If you can answer these questions easily for each social media or blog post you do, then you are making sure that each one has intention and your social media has a purpose and will contribute to your business goals. And guess what? If you implement this, you are going to create great posts that are relevant and engaging. Why is that important? Because engaging posts win in all the new social media algorithms.